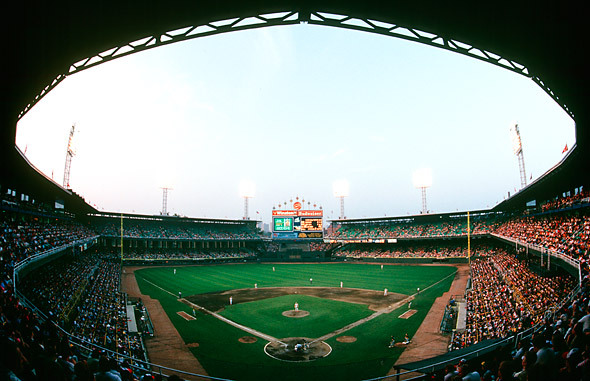 Comiskey Park as it looked during the late 1980's. With U.S. Cellular Field now into its 19th year as home of the Chicago White Sox, it’s hard to believe that on September 30th of this year, 20 years will have gone by since old Comiskey Park played host to its last White Sox game. Shortly thereafter it would ultimately meet the wrecking ball and eventually turned into a parking lot. 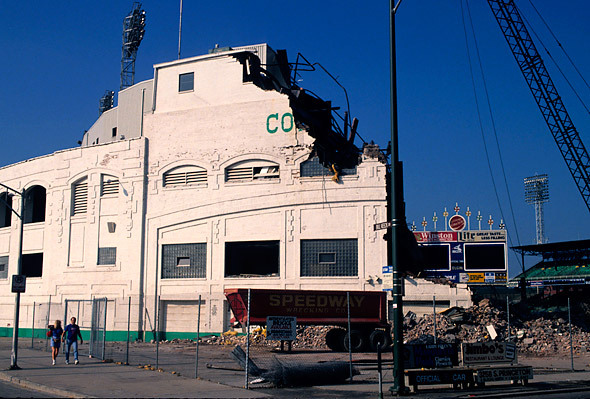 Old Comiskey Park met the wrecking ball late in 1991. Those 19 years have flown by. It seems like yesterday (actually, August 17, 1963) that I attended my first game at that grand old stadium located at the corner of 35th and Shields. I remember two things about that day. They White Sox, behind Gary Peters, defeated the New York Yankees 2-0, and I ate too many hot dogs! As a wide-eyed 7 year old, I still remember the awesome feeling I had when I stepped up the stairs behind home plate and saw the field in person for the first time. A young White Sox fan attends a game at Comiskey Park during the 1988 season. Everything seemed much closer and larger than on TV. 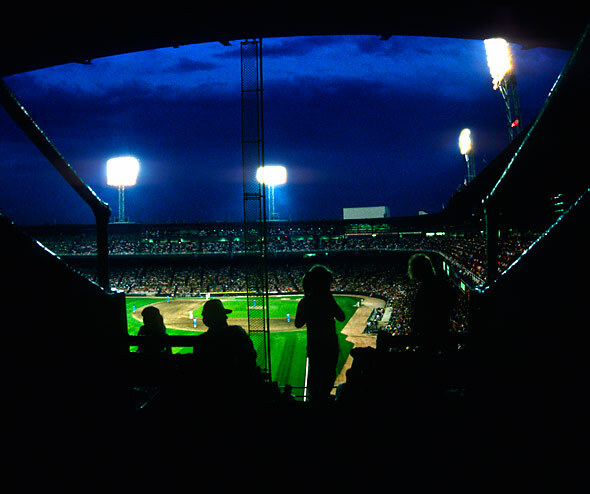 Over the years, I spent more and more time at Comiskey, taking in twi-night doubleheaders (remember them?) or coming down for a Sunday afternoon matinee. As my interest in photography began to take hold, I started taking my camera with me to the ballgame. It seemed like most of the time I was more interested in getting a “great shot” of Chet Lemon or Wilbur Wood than I was watching the game itself. Little did I know at the time the seeds were starting to be sown into what eventually became my career, that as a professional sports photographer and official team photographer for the Chicago White Sox. I loved many of the nuances that Comiskey Park offered. One particular favorite of mine was the Picnic Area. What a great place to take in a ballgame! 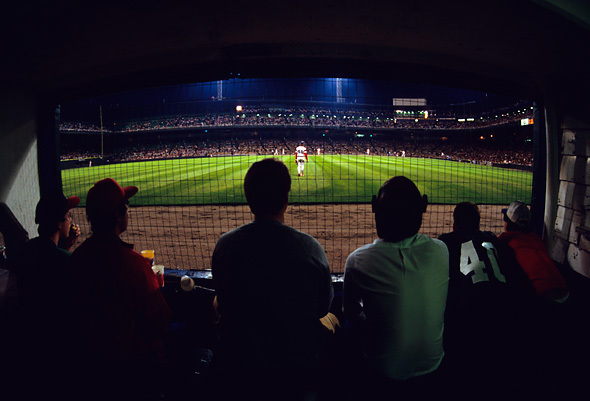 The Picnic Area at Comiskey Park offered some of the best seats, and views, in the house. If you got to the park early, you could grab a bite to eat from one of the many vendors located nearby, and then park yourself on a picnic bench while being able to watch the game at ground level. You could actually talk to the left fielder if you wanted. Sweet seats indeed. Carlton Fisk visits with the White Sox faithful during a break in the action. Many of the new ballparks today incorporate what Comiskey Park innovated. Of course, when Comiskey Park reached its 90th birthday, it started to show its age. Sight lines were obstructed at certain seat locations, and it could get very cozy downstairs in the concourse. She was getting old, and it was time for something new. Plans were made to construct a new ballpark across the street, and on April 18, 1991, the “New” Comiskey Park opened its doors. Shortly thereafter, work began on the demolition of Comiskey Park, and now the only sign of its existence is a placard indicating where home plate and the foul lines were. 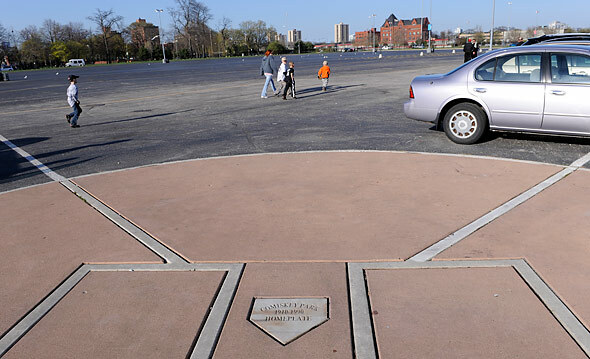 Home plate from old Comiskey Park is commemorated in parking lot B at U.S. Cellular Field. Over the past few years, there have been a series of renovations to what is now U.S. Cellular Field that helped establish a unique personality that the original version of the ballpark seemed to lack. The 2005 World Series most definitely helped solidify that personality by providing memories that will always be cherished and never forgotten by White Sox fans. 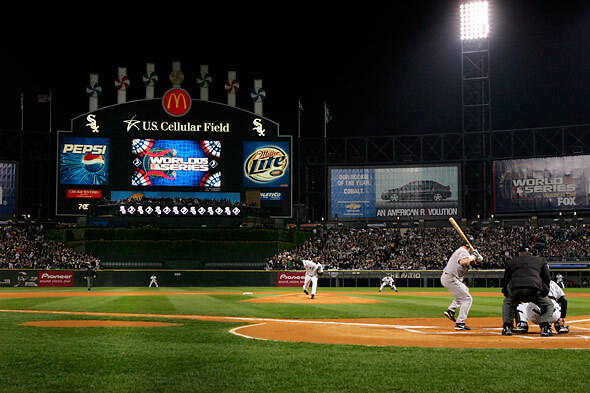 U.S. Cellular Field established itself forever when it played host to the 2005 World Series. I can only imagine that at every game there is another 7 year old making his or her first trip to the ballpark, this time U.S. Cellular Field, experiencing the awe of viewing the field in person for the first time. And with that, more memories are made. 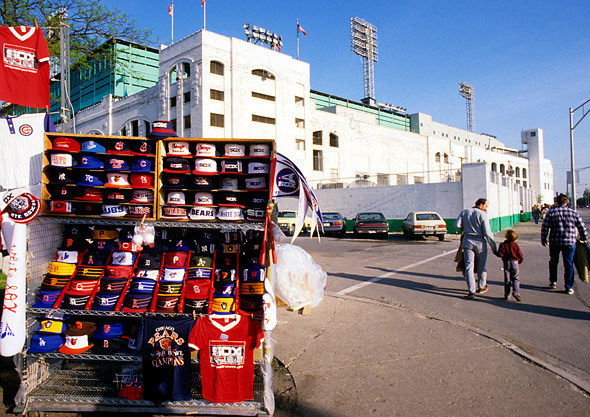 A father and son walk hand in hand outside of Comiskey Park after visiting a souvenir stand. Memories to be shared with future generations of White Sox fans. 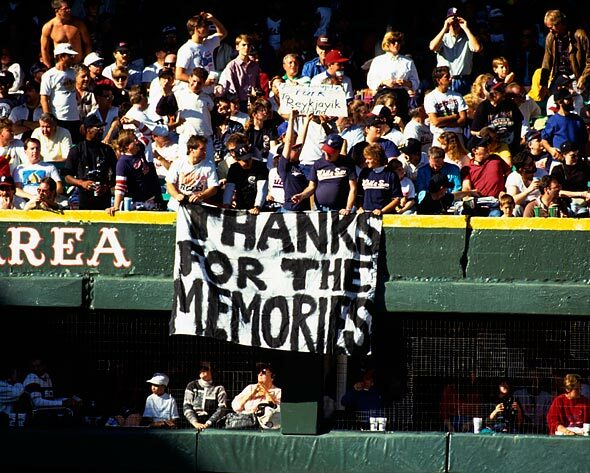 The sign says it all as the fans pay tribute to Comiskey Park as its journey came to an end on September 30, 1990. This entry was posted on Tuesday, April 13th, 2010 at 10:22 AM	and is filed under Chicago White Sox. You can follow any responses to this entry through the RSS 2.0 feed. Great memories of the old park. That picture no 2 of the wreaking ball should be viewed with caution by anyone who visted the old park, it is tough to see a place with that many memories come down. Glad they kept the old home plate and foul lines in the parking lot.